You may not be aware of the fact that animals mature faster than people; in fact on average pets age seven times faster than people. Because animals age so rapidly, significant health changes can occur in a very short period of time. The risks involved with these changes increase with age. 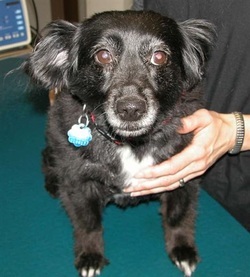 A Comprehensive Physical Examination - allows the veterinarian to assess any abnormalities. A Complete Blood Panel - Suppies us with a baseline of the various organ functions, and includes a Complete Blood Count that will help indicate if your pet has an infection or is anemic. Urinalysis - to screen for urinary tract infections and kidney function. Tonometry - permits us to check the pressures of the eyes and can help detect glaucoma. Blood Pressure Measurement - used to check for hypertension. High blood pressure can lead to problems with the kidneys, heart disease, and even blindness. X-rays - the first set of X-rays are included in our senior health program. X-rays of the chest will be used to assess the heart and lungs, but further x-rays may be used to determine if your pet has a problem with arthritis, or another condition. Ultrasound Examination - Will allow the doctor to visualize the internal organs in a non-invasive manner. By offering these services in packages we are able to offer them at a discounted price. The Extensive Senior Health Evaluation includes: everything listed including an extensive blood panel and a total savings of 30% off! The Senior Health Evaluation includes: The Senior Exam, Complete Blood Panel, Thyroid Test, Urinalysis, Tonometry, and Blood Pressure Measurement. This package is available at a savings of 20% off! The Basic Senior Health Evaluation includes: The Senior Exam, Complete Blood Panel, Thyroid Test, and Urinalysis. This package is available at a savings of 10% off! (Prices exclude any sedation, additional services, or testing).